One of the perks of coaching our 13 year-old son, Jack’s, soccer team is getting to know the parents of our team members. (Disclaimer: Joe does the coaching, I do the Starbucks run and cheering) One of the families we’ve had the pleasure of getting to know is Vince and Denise Brigantino. As a thank you gift for coaching (and cheering), they gave us a lovely bottle of their family grown Cabernet Sauvignon. We uncorked it tonight, let it breath for about an hour, and served it with Baked Ziti – yum! This 2004 bottle, No. 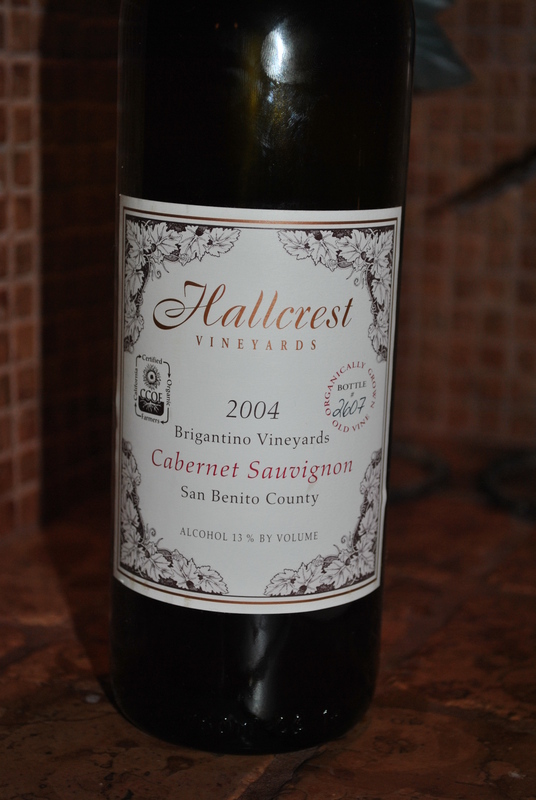 2607, is certified organic by the California Certified Organic Farmers (CCOF), grown in San Benito County, and bottled by Hallcrest Vineyards in Felton, California. Smooth and rich, with a hint of berries. 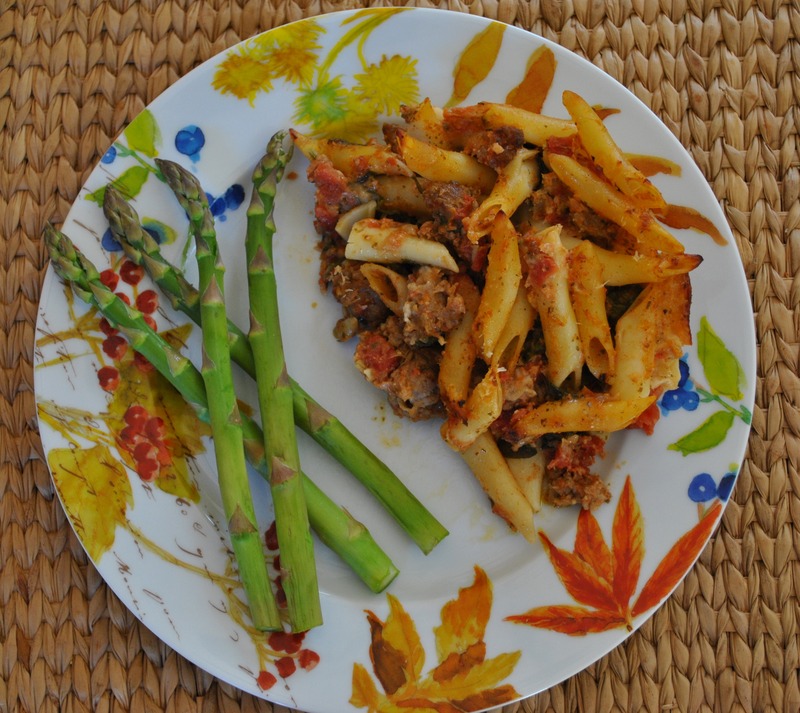 We served it with one of my favorite wintertime recipes: Baked Ziti. This is a great recipe to use up extra wintertime spinach. It also re-heats well for leftovers. 12 oz. Italian sausage, 1 medium onion, 3 lg. garlic cloves, chopped, 1 28 oz. can diced tomatoes in juice, 1/2 cup pesto sauce, salt & pepper, olive oil, 10 oz. ziti pasta, 1 12 oz. bag ready-to-use spinach, 8 oz. mozzarella, shredded, 1 c. parmesan cheese. Saute sausage with onion and garlic until meat is cooked through. Simmer for 10 min. Stir in pesto, season with s&p. Preheat oven to 350 degrees. Cook ziti (or penne) al dente. Drain pasta, add spinach, allowing to wilt. Add mozzarella and 1/2 c. parmesean. Combine with sausage mixture. Transfer to 9×13 baking dish, sprinkle with remaining Parmesan cheese and bake for 30m minutes. Serve with warm bread and a tossed green salad. Soccer moms unite. Can’t think of a better way to spend the day than watching our kids have fun, get exercise, learn how to be part of a team, and get to know other parents. Winning is secondary. (Julie speaking, here, not Joe.) Here’s to the Brigantinos … who know how to make good wine and have fun sharing it. Bon Appetit!